Renowned for superb quality porcelain, Royal Crown Derby utilised the services of some of the best and most respected ceramics artists. In the early days William ‘Quaker’ Pegg took over from William Billingsley as chief flower painter and early Derby and Chelsea-Derby cabinet plates bear the most wonderful depictions of flowers and plants of any porcelain. William Billingsley was one of best flower painters at Derby together with William Pegg. Roses were his favourite subject, and china decorated with borders of his ‘running roses’ became a special feature of the Derby factory. Later Billingsley worked at Pinxton, Mansfield, Worcester, Nantgarw, Swansea and Coalport, and these factories also adopted his style. 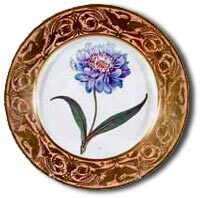 In the 1780s, Billingsley developed a new naturalistic style of flower painting on ceramics. His technique involved painting with a heavily loaded brush, and then wiping away much of the paint with an almost dry brush, to produce particularly delicate colours and highlights. The Billingsley Prentice Plate was made especially for the instruction of apprentices at the Derby factory. In 1813, William Billingsley and his son-in-law Samuel Walker established the Nantgarw Pottery. William came to Nantgarw from the Worcester Porcelain Factory. William who also went by the alias William Beeley, was a well-known painter of flowers, especially roses, but also painted shells and landscapes. He painted dessert, tea and coffee services, plates, dishes and tureens. 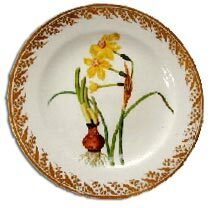 Plates were the main product at Nantgarw in the early years but few were decorated. The porcelain was sold to dealers “in the white” and was decorated according to the current fashion. The Nantgarw pottery was started with only £250 capital and suffered financial problems from the start. 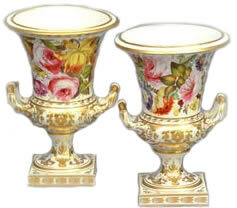 William Billingsley was interested in the manufacture of soft paste porcelain, the finest of which was produced in France. Nantgarw porcelain was known as artificial soft from the nature of its paste or body which could be potted very thinly and was made to Billingsley’s secret formula: a synthetic mixture of alkaline and aluminum silicates with added bone ash. Bones, burnt and mixed with clay, were ground by miller David Jones in a mill adjoining the Cross Keys public house. The water wheel was powered by a leat running from the canal to the River Taff. The high temperature needed to produce perfect pieces made Billingsley soft paste method difficult to fire. 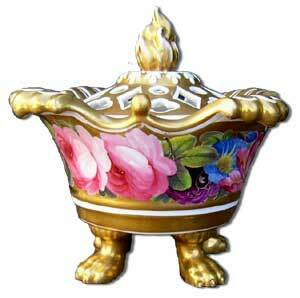 As much as 90% of production was ruined in the firing process and was taken from the kiln damaged and unusable. With only a small financial capital to work with, and high production losses Billingsley and Walker were constantly running short of money. By 1814 they had used their initial £250 and also and additional £600 advanced by Walker as a partner. Their petition to the government for financial support was unsuccessful and so they closed the pottery in 1814. At this time Billingsley and Walker joined Lewis Weston Dillwyn at his Swansea pottery, but the soft paste method once again proved to be too expensive and so Billingsley concentrated on painting porcelain. Derby Artist – William (Quaker) Pegg. William Pegg, or William ‘Quaker’ Pegg as he is often referred to, is regarded by many as being the finest flower painter to have ever worked in ceramics. At the age of 15 William Pegg started an apprenticeship as a china painter at one of the Staffordshire potteries. The hours were long and hard but when he had finished at the factory William Pegg would go home and study further. He wrote that he found it a punishing schedule but his efforts served him well. In 1796, aged twenty one, he was offered the post of chief flower painter at the Derby factory to succeed the innovative and well respected William Billingsley. William Pegg spent two periods of time at the factory with a substantial gap between and there is a marked difference in his work over that time. His original pieces are marked on the back with a blue factory mark and the plants latin and common names. William also produced copies or ‘reorders’ of known Derby patterns from an earlier period and these bare a puce mark and don’t usually carry the plants name. After painting at Derby for five years, his convictions led him towards the Quakers. He followed their doctrines of simplicity and lack of decoration devoutly and despite frequent comments and guidance from his fellow workers and friends decided that his china painting was frivolous and an affront to God. He left the factory and the profession to become a knitter of hosiery. William Pegg (or Quaker Pegg as he became known to his colleagues) returned to the Derby factory in 1813. There was a noticable change to his style of rendition during his second period. His work was always big and bold but now displayed a freedom of expression that was to increase over the coming years and which is often described as flamboyant. Flowers now have seem to create a mood. Still botanically accurate but now grouped and positioned for maximum visual impact. Pieces from this second period normally carry a red factory mark along with the plants identification. Most of his work during this time was done in conjunction with the same gilder and often has the gilders mark ‘2’ on the back. In 1820, after being at the factory for seven years on this second occasion his religious fervour seems to have taken hold again. At the age of 45 William left the profession again and opened a small shop at his home where he worked with his wife for the rest of his life. William ‘Quaker Pegg died shortly after Christmas in 1851. In 1893 both Gresley brothers started work at the Derby Porcelain factory. Cuthbert was a truly accomplished ceramics painter with flowers and landscapes being his specialities, but he turned his hand to painting anything that was required. He was regarded as one of Derby’s finest artists and worked on the service presented by Derby on the marriage of Princess Mary of Cambridge. Cuthbert Gresley loved musiv and was a reasonably accomplished singer. He lived at Chelleston and Shelton Lock in Derbyshire, England. The Gresley dynasty of painters covers three generations and includes: Harold Gresley, Cuthbert Gresley, James Stephen Gresley and Frank Gresley. John was the elder of two brothers who both worked at Derby. Their parents were both artists and from 1762-1767 had studios in London at Rupert Street. John Brewer started working at Derby in 1795. 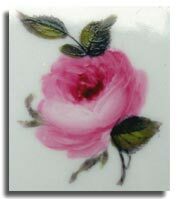 He was a talented watercolour painter, who had never applied his art to porcelain painting. At Derby he painted a variety of subjects including plant and flower painting. Mr Strutt’s Cotton Mill at Milford 1787. Water Colour by Zachariah Boreman. Zachariah Boreman was an accomplished landscape and marine subject painter, who was born in Aldersgate, London. He was initially apprenticed to the Chelsea factory and worked under Nicholas Sprimont from 1755 to 1783. He eventually signed a three year agreement with William Duesbury. He painted subjects from nature and often included a winding river in his compositions. Boreman eventually became one of the finest ever landscape artists. He also painted exotic birds and small models known as Chelsea toys. Zachariah Boreman painted the Mecklenburg service commissioned by Queen Charlotte for her brother the Duke of Mecklenburg. He taught Billingsley the art of ceramics painting and encouraged and experimented with him; firing new ceramic body types in the basement of Billingsley’s house. Zachariah Boreman left Derby to join Simms Decorating in Pimlico, London. He remained with Simms for the remainder of his life. 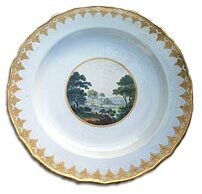 Derby Landscape plate Painted by the father of English landscape painting on porcelain, Zachariah Boreman c.1794. Blue mark pattern no 18, which is a mistake. It should be pattern no 182. Named view “Near Breadsall Derbyshire”. Also note the honey gilding which is superb quality.